There’s more life in this desert than in a whole neighbourhood. It’s a matter of understanding. For more than 40 years I’ve lived in big cities, where cement predominate. We have the green of the parks of course; better luck the blue of the sea, but the main colour is grey anyhow. Here in Fuerteventura grey doesn’t exist. There are endless shades of yellow, red, orange, ochre, turquoise, green, white, blue. There’s nothing grey at all. That’s the reason why I had to teach my eyes to see again. Like a newborn, whose sight improves day by day. So weird, but at first I couldn’t work out those never ending shades of the desert. It looked flat to me; I wasn’t able to observe properly. Now, I count any slight tone even a small stone. Before moving here, I assumed the desert was an unwelcoming environment, unsuitable for life and dangerous too. 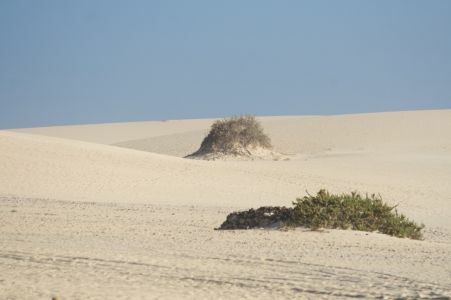 Just a landscape for taking photos, or a chance to attract visitors with desert safari tours, BBQ dinner in the beautiful desert (fake) camp and why not, camel trips. Our desert here is something else. It’s an enchanting dimension: is such an alive, cozy and peaceful world. There are creatures whose unfinished thirst for life makes them flexible and adaptive to our dry climate. The desert temperature range offers a poor quantity of water, but enough to fat plants and bushes. Botanical masterpieces, creating with their bloom quite a rural landscape during some months in the year. No matter how much sand the wind blows on these plants: their thirst of life always comes to light. Seldom rain triggers the miracle of life, fast and powerful: plants grow and blossom in a very short time, following an accelerating cycle to enjoy plenty of water for such a short time. I observe them tenderly with admiration. I envy them a little, since they are able to exploit what is offered, without regrets. They know what best suits them, they don’t need any advice or operating manual. They do their thing, no matter who’s watching or judging. There, the human being jars; his presence is useless or dangerous, if he is not moved by the pureness and perfection in nature and desert life.